Dylan Alcott shares advice on starting a small business, tackling barriers and why it is important to have people with a disability in the workforce. At only 27 years old, Dylan Alcott has an impressive list of achievements and a wealth of experience to his name. On top of being a passionate disability advocate, he is also a presenter on Triple J radio, the founder of Melbourne’s first all access music festival, runs his own charity, and has represented Australia across the world in basketball and tennis. Dylan recently led an event encouraging entrepreneurialism, business ownership and self-dependence as part of the Victorian Small Business Festival. 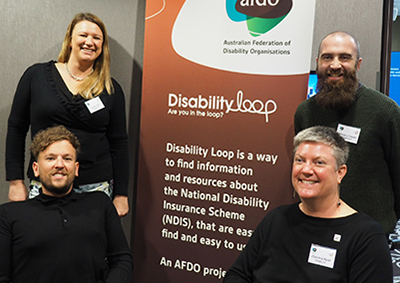 Hosted by the Australian Federation of Disability Organisations, the event showcased entrepreneurs who have a disability, as well as highlighting resources and tools available to support others thinking about establishing their own ventures. "Events like this are really important. Sharing knowledge, sharing what works and what doesn’t work, but also getting the confidence to get out there and do it," Dylan says. "You have to hear stories and find role models when things work as opposed to just constantly taking the risk upon yourself." He concedes starting a business or beginning the journey as an entrepreneur can be difficult for people with a disability. New and different hurdles make everyday tasks more challenging, but his advice is simple. "I would tell somebody that is thinking about starting their own business to go for it," he comments. "Being your own boss is great. When you have a disability, sometimes things like getting ready takes a little bit longer, but when you are your own boss you can dictate your schedule to fit into your own life." Through his own achievements and experience, Dylan knows first-hand the value people with a disability can bring to the workforce, the strength of their new ideas and innovative thinking. "I think there is a huge untapped potential for Australians with a disability to get out there in the workforce. We represent one in five of the whole community, 20 per cent of the Australian population," he states. "If you try and tell me that there aren’t some incredible people that are great employees, with amazing values and great work ethic within that 20 per cent, you are kidding yourself." Dylan’s final comments resonate strongly and are a true indication of his drive to learn more and meet new people - "there were incredible people in the room at the event (at the Small Business Festival) who’ve had some great successful organisations that are still going today. I even learned something new myself." The Small Business Festival runs until 31 August and includes more than 75 events focused on social inclusion, including people with disability, women and Aboriginal people. More information can be found at the Small Business Festival website.